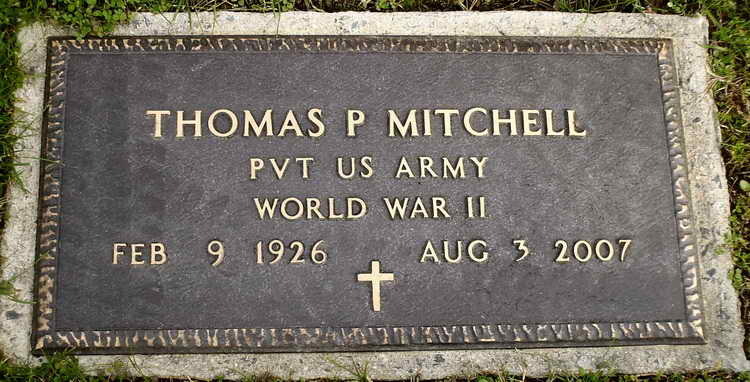 Grave marker for Thomas P. Mitchell in Saint Aloysius Cemetery, Hardwick (Worcester county), Massachusetts. .Thomas enlisted in the Army at Ft Devens, MA on 22 September 1944 with the preference of the Air Corps. However he chose instead to become a parachutist and was assigned to Company H, 508th PIR. Pvt Mitchell went into combat during the Battle of The Bulge and was listed as slightly injured (non-battle casualty) on 11 January 1945, probably a victim of frostbite. He was transferred to an unknown hospital and did not return to the regiment.